You can easily forward calls from your iPhone to any other phone number. This is a great trick to use in a ton of situations, whether you want to send calls to an office line or landline, you’re in an area with bad reception for and want to redirect calls to a phone with better service, you’re taking a vacation to somewhere without cell service at all and want to leave your phone at home, or if you’re traveling and want to send your calls to a low-cost dumb phone. You can even forward your number to a Skype or Google Voice number if you’d rather accept inbound calls on a VOIP provider, whether that’s on another iOS device or a computer. Forwarding calls from an iPhone this way does not need any cell provider approval, service, and there are no additional fees to use the call forwarding feature and service, it’s free and everything is done right on your iPhone through the phone settings. This article will walk you through exactly what to do to forward all phone calls from iPhone to another phone number. This will forward all inbound calls to the number you specify, it lasts until the call forward feature has been turned off. As soon as a number is entered, the calls will start forwarding. The example shown is forwarding calls to a number that doesn’t exist, but of course you would put in a real phone number to forward the iPhone calls to. The receiving phone can be any type of phone number, it could be another iPhone, an Android, a feature phone, smartphone, a land line, a VOIP number for Skype or Google Voice, or nearly any other phone number you can think of. From an inbound callers perspective, nothing is different, but your iPhone will no longer ring and instead it will just send the calls off to the number you specified. You can still make phone calls out as usual with forwarding on, but return calls will not come back to your phone number even though that number remains on caller id. By entering your own voicemail number, you can also forward all inbound calls to voicemail instantly, without having to turn the phone off or manually send an incoming call to voicemail every time. Another interesting trick with this that can be handy in some situations is to pretend that your iPhone number is no longer in service, by forwarding it to a phone number that’s not active. To do that, you’d need to find a phone number with no active service and forward the iPhone calls to that number. 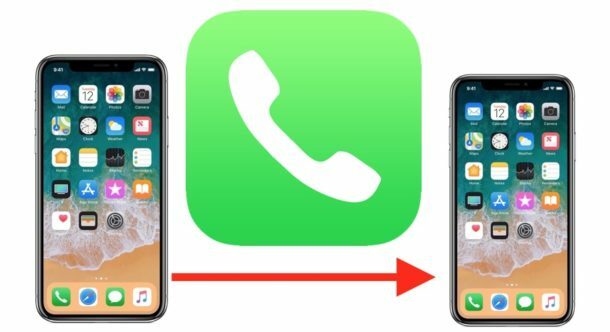 The phone icon should disappear from the status / title bar on the iPhone, and the iPhone will accept inbound phone calls and ring again as usual as long as the call forward feature is disabled. Disable Call Forwarding with *73: Dial *73 at any time to disable call forwarding and receive calls on the phone as normal. The plus side to this difference is that the trick is universal for all devices and not exclusive to iPhone, meaning you can forward any Verizon number using the *72 method. The *72 and *73 approach works on many different types of cellular and mobile providers, so if the Settings based approach on iPhone is not available or working for you, then you can try this one instead. 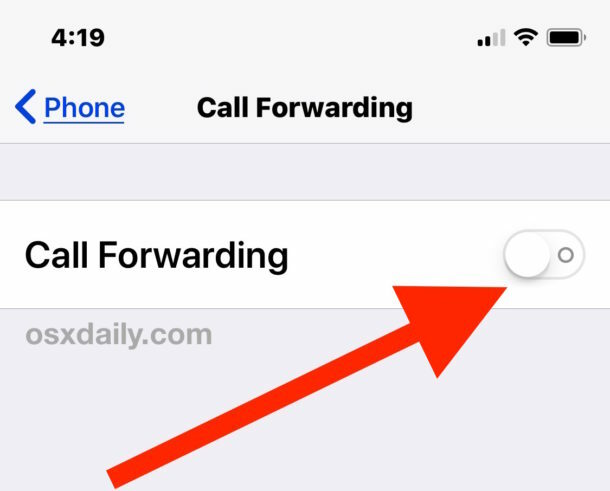 By the way, if you have an older iPhone device running an earlier release of iOS system software, the call forwarding feature continues to work exactly the same, however the interface to enable the call forwarding option will look a little different in the Settings app. The settings appearance for call forwarding thus looks different in those releases, but all functionality is the same on the iPhone itself. Visual differences aside, whether you’re setting up a call forward on an iPhone X, iPhone Plus, iPhone SE, iPhone 8, iPhone 7, iPhone 6, iPhone 5s, iPhone SE, iPhone 4, or anything else, you’ll find the setting works and the calls will forward as expected. 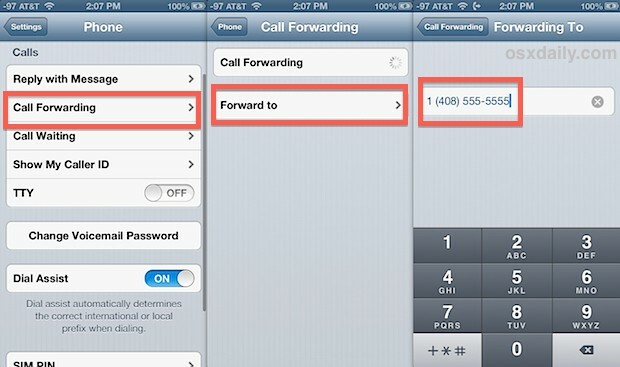 Do you use call forwarding on your iPhone? Do you know of any other helpful tips, tricks, or interesting tidbits about call forwarding on the iPhone or in general? Share with us in the comments below! Add your own voice mail number and you can keep your phone turned on, still get new voice mails alerts, and still make calls out. I think that’s better than Do Not Disturb in my opinion! It should be noted that this is only for AT&T iphone service. Verizon and other phone services are different. Really? Gsm only then? How do you do it on Verizon? On Verizon to forward your phone you dial *72 + phone number you are forwarding to. *73 to disable call forwarding. I just think its a software issue between the providers. Yes ATT is easier but in my area Verizon has better service. Sprint is also not built into iPhone’s settings, and what you’d probably expect isn’t free. They use a method that involves slightly different codes to turn toggle various types of forwarding. The type of forwarding described in this OS X Daily post, that is instant and can circumvent bad reception, has a $0.20 per/minute fee in addition to what you’re already paying (in most cases). The free types are limited in that they have to ring through to your mobile first before being rerouted to ring yet again. Stacking the time for two sets of rings will not only be annoying to your callers, it will be annoying for you as you repeatedly explain the long ring. Too bad Apple and the other carriers didn’t/couldn’t/wouldn’t work together on this to create on/off toggles as for AT&T. It really shouldn’t be complicated, hard-to-remember, and cost even more than our slower-in-reality plans (now I understand why Sprint is not afraid of “unlimited” data plans). Little follow-up: Call forwarding for Sprint is slightly built-in to iPhone’s settings. What would you think if AT&T only had an “off” button for call forwarding, but not an “on” button? Behold Sprint’s “off” button: Settings > Phone > Sprint Services > Call Forwarding Disable. There is no “on” button. There is no “on” button. There is nothing about on the free forward methods. hhhmm, good information, I think the gsm service provided will charge us for call forwarding service charges. Not possible on Sprint as far as I can tell. Would be nice, though…. I can fwd my skype calls after a designated number of rings–now that’s really useful as I can answer the calls at home but they’ll fwd if I’m on the road. Anyone? Does anyone know how to make call-forwarding on specific phone number only? I worked at this for a couple hours with phone help. No was does it work for me. I can only forward my calls by calling AT&T and asking them to do it for me. I like to forward to vonage or magic jack when I travel over seas. need a sloution to the above! Is there an iPhone icon to quickly enable/disable call forwarding instead of going through the settings icon? I am trying to call forward from att i6 plus to an international number and will not work. Please help. How do I forward my calls from my iphone4(straighttalkprepaid) to my iphone6plus(formerly sprint) without having service on the latter? how we can distinguish that the received call on ( B iPhone ) was forwarded from the main ( A iPhone ) you have ever setup it to forward all received call ? If call forwarding is used – where is the location of the phone indicated on Find my Friends?